Most new employees are full of enthusiasm and optimism when entering a new role in a new company, and are willing to go above and beyond the call of duty. Whether it's through a sense of appreciation for being given the opportunity, or an effort to prove themselves, the new starter wants to be there, and wants to get results – and it shows! Sadly, the initial buzz rarely lasts very long. Research shows that their level of engagement goes into freefall after just a few months. But at what point did you lose them? Is the job not what they expected, or does the problem run much deeper? According to ProClinical's Engagement Report, 71% employees in the life sciences industry are engaged at work in their first 6 months at a new company (its highest point), but this drops to 66% between 6-12 months and continues to decline until it's lowest point when they have been there between 3-5 years (engagement goes back up again for longer serving employees). For new hires, the onboarding process is an absolutely critical stage in their engagement. It can erase any doubts that they might have had over their decision to accept your job offer but it can also create fresh ones. Ensuring that an employee has the required tools, training and support to do their job is essential and should be planned in advance of their arrival. Whether your organisation has a structured onboarding training programmes in place, or offers new employees on-the-job training, welcoming them with a positive and encouraging attitude can lead to a better performing, engaged employee. Simple things can make such a difference; like having the manager call a new recruit before their start date to tell them they are pleased to have them join the team, preparing their workstation with the correct IT equipment so it's ready to go when they arrive, preparing their calendar, first assignment and training, setting up meetings with key people, and having a buddy give them a tour and take them to lunch on their first day. Not only will these simple things make them feel welcome, and enable them to get on with doing the job you hired them for, it will strengthen your employer brand as a whole by creating a positive impression in their mind that the company cares about them and is a great place to work. First impressions will remain with the employee, so make it a positive one. Do the opposite, and it will be much harder to correct later. Using our onboarding checklist each time you hire someone new, can ensure that consistently every new employee begins on the best foot possible. If 71% of employees are engaged in their first 6 months, that means 29% aren't. Did all of them have a poor on-boarding experience? Not necessarily. New employees can of course have their doubts before they even start. Perhaps they were in no position to turn the job down, or view it as just a necessary stepping-stone in the bigger picture of their career. How do you engage people like that? The truth is that the seeds of engagement are planted before the recruitment process even begins. Therefore, it is possible for employees to become disengaged at any point during the candidate experience, from the initial point of interaction to when they are fully integrated into the business. In recent years, companies have learned that candidate experience is vital to an engaged workforce. Assuming that the company has been able to successfully engage the candidate enough to arrange an interview, a lot is riding on the candidate’s experience of the company during the interview process. This will greatly affect not only their decision to accept a job offer, but also your ability to retain them and attract other candidates. Not sure how? Check out ProClinical’s guide to the relationship between engagement and the recruitment process. The Candidate Experience report states that candidates will share positive reviews of the company’s interviewing process on social media 51% of the time, and negative reviews around 34% of the time, so whether you hire them or not, every candidate plays a role in your company's ability to attract future talent. Impressions of what is it like to work for a company – known as the 'employer brand' – form at every touch point. Platforms such as social media and employer review sites have the power to affect a prospective employee’s desire to work for a company, leading potential candidates to form an opinion before any vacancy has been created or interview arranged. Particularly for the more well-known life science companies, their reputation will precede them so when it comes to attracting talent, employers must reckon with candidates’ preconceptions of their company. According to the Candidate Experience report, as many as 78% of people choose to apply for a job based on their own research of the company. During the research phase, candidates are looking for signs that they are compatible with the company's values. They will seek out employee testimonials for candid reviews on what really goes on day-to-day, which are easily accessible on sites such as Glassdoor, or through social media posts on LinkedIn, Facebook or Twitter. If, through their research, a prospective candidate has formed a less than favourable opinion, this can create an immediate barrier between them and the employer. A poor employer brand will make it more challenging for companies to engage with great talent, and should they succeed in doing so, preconceptions can remain – even in the candidates who are eventually hired. Low employee engagement perpetuates because disengaged employees influence potential candidates, who go on to become other disengaged employees. But you can start to break this vicious cycle by implementing practices that improve engagement in existing employees, new hires and your future hires too. For more detailed information on how to drive engagement through your employer brand, recruitment processes and onboarding programme, download ProClinical’s guide. 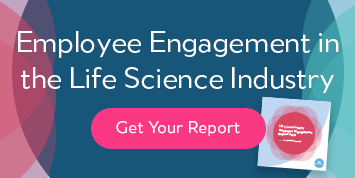 Our most recent employee engagement report is packed full of interesting insights into what motivates life sciences employees across the globe, and will help you to build an employee engagement strategy that will bolster your business.